The city of the supreme god Brahma, spread out around its sacred lake, exudes the heady scent of spirituality that emanates from all leading pilgrimage centres. 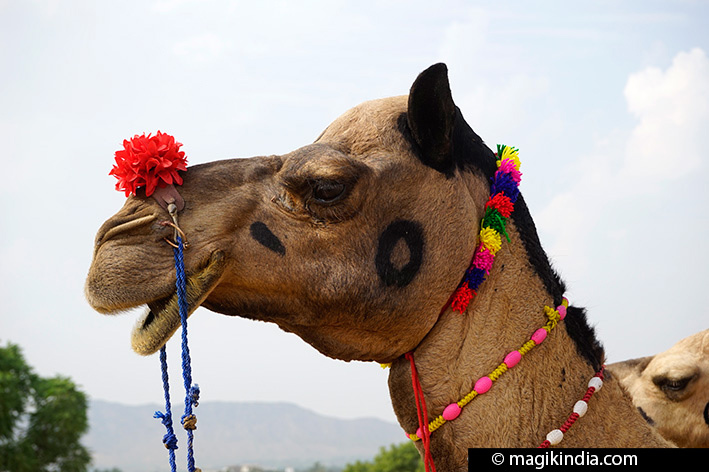 In October the peaceful town comes alive as pilgrims and camel drivers gather in their thousands for the Pushkar Fair. 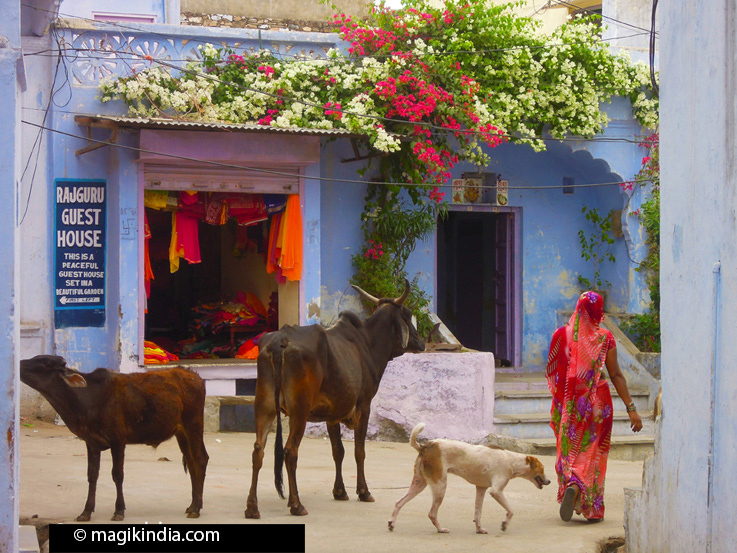 Pushkar (Sanskrit name for the blue lotus) is one of the oldest towns in India and a major pilgrimage centre. According to one of many legends about it, it was founded by the god Brahma himself. He is said to have killed the demon Vajra Nabh with a lotus flower. The petals then floated down to earth and landed in three places; in each place a lake appeared, Pushkar Lake being one of them. 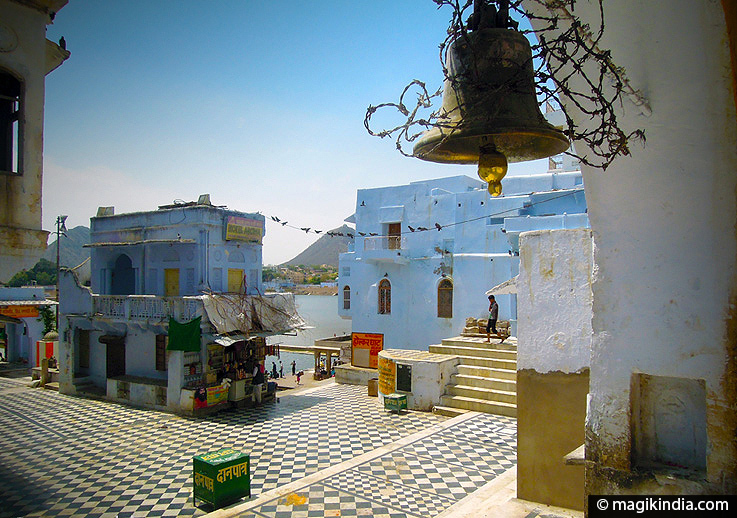 There is a belief that Pushkar should be visited after the ‘Char Dham’ pilgrimage. In this way pilgrims can obtain salvation. Once a year, on Kartik Poornima, the full moon night of the Hindu lunar month of Kartik (October – November), a religious festival is held in Brahma’s honour. Thousands of pilgrims come to bathe in the holy Pushkar Lake adjacent to the Brahma temple. Various rites are also held at the temple during the fair. This day also marks the beginning of the famous ‘Pushkar Camel Fair’. Camel fair: Pushkar’s annual camel fair, the largest in India, is unique. Tens of thousands of camels are brought to the town to be sold or exchanged, and there are numerous events and festivities reflecting the rich culture of Rajasthan. The lake and its 52 ghats (flight of steps leading down to the water) are a delight at any time of day, though of course they are busiest in the morning when pilgrims come down to the lake for their ritual ablutions. Visitors are expected to respect the privacy of the faithful taking their ritual baths. 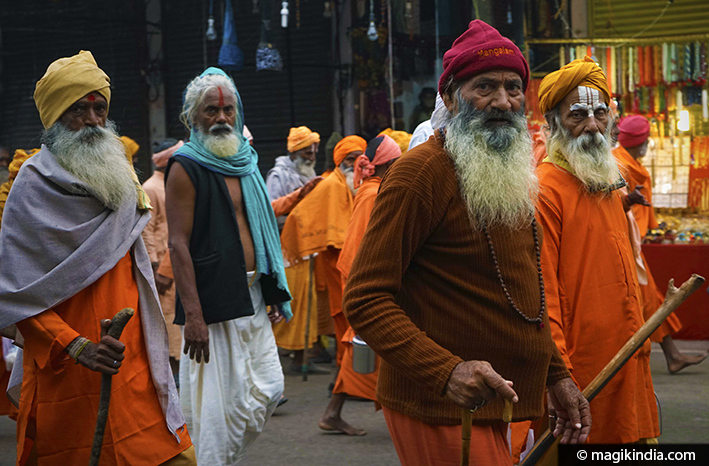 As in Varanasi and Haridwar, an arati ceremony is held each evening at sunset to the sound of sacred chants. The ceremony is dedicated to the lake itself. There are more than 400 temples in the town, but Jagatpita temple is the most visited because it is the only one dedicated to Brahma, creator of the universe. The existing structure dates from the 14th century but there is said to have been a temple on the site for 2000 years. It is a major place of pilgrimage, most of all in October when the Hindu Kartika Purnima festival is held. This is also when the Pushkar Camel Festival takes place. 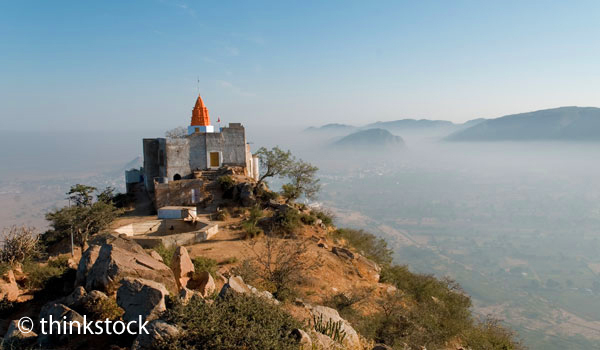 Savitri temple stands atop a hill overlooking Pushkar town. Legend has it that when Brahma performed a yagna (fire ritual) beside the lake, Savitri, his first wife, was unable to arrive in time so Brahma performed the ritual with another goddess, Gayatri, who became his second wife. Savitri was so angry that she went off to the top of the hill and settled there. She insisted on her right to be worshipped before Gayatri. That tradition still holds: at arati (the flame offering), the lamps are offered first to Savitri and then to Gayatri. The temple is fairly new (20th century), but the statue of Savitri is said to date from the 7th century. One can amble forever up and down Pushkar bazaar. For one thing it borders the ever-enchanting lake. For another, hidden among the trinkets and knick-knacks for sale you may find some fine craft work and curios such as old jewellery. Strolling through these streets is a real pleasure. 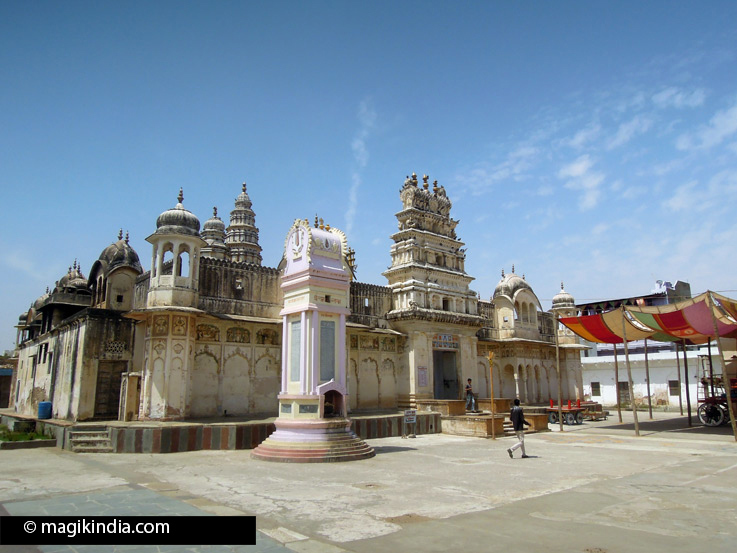 The graceful Old Rangji temple was built in 1823 by Seth Puran Mal Ganeriwal of Hyderabad. It is dedicated to Rangji, one of the incarnations of the Hindu god Vishnu. It is unique in being built in three different architectural styles, Mughal, Rajput and Dravidian (South Indian). Non-Hindus are not allowed in, but its exterior is well worth a look. There is another, more recent, Rangji temple on the way into town. It too is forbidden to foreigners. the ashram of a saddhu (ascetic) nicknamed Aloo Baba because he only eats potatoes (aloo being Hindi for “potato”). His temple is covered in a variety of graffiti: this sadhu is an original, and one with a sense of humour. He enjoys having Westerners around and spending time with them. 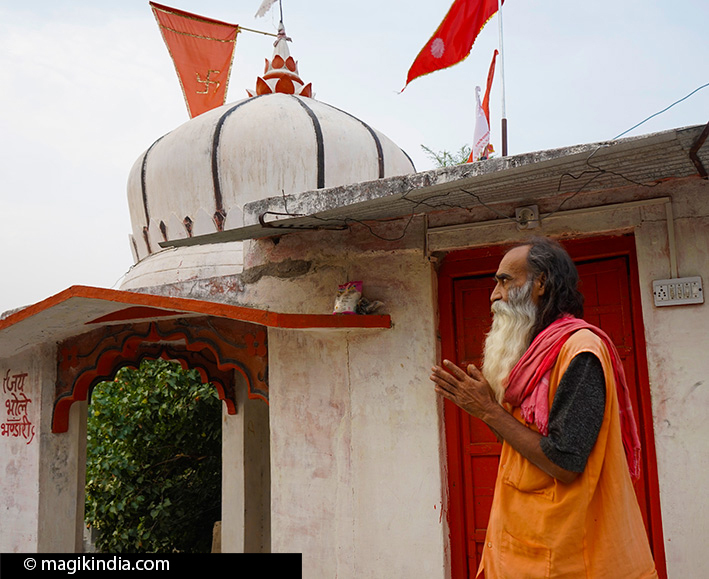 It is well worth visiting these two Shiva temples set in a picturesque, unspoilt landscape. 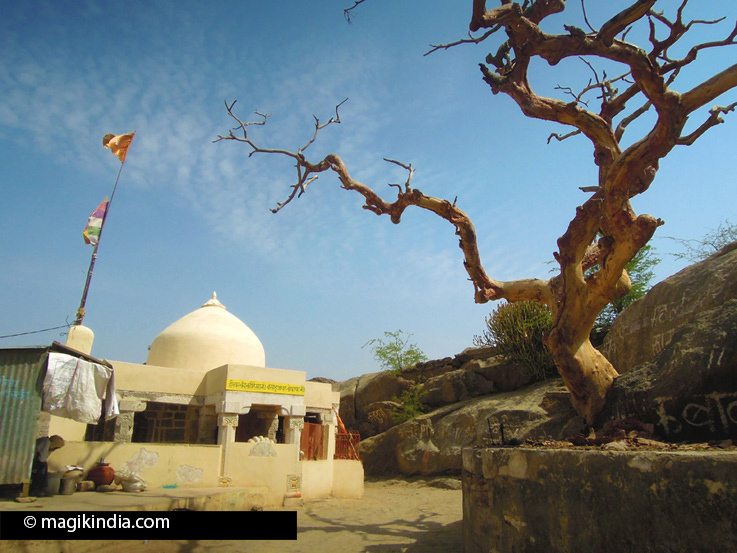 Ajay Pal temple was built in the 11th century by Raja Ajay Pal, founder of Ajmer. 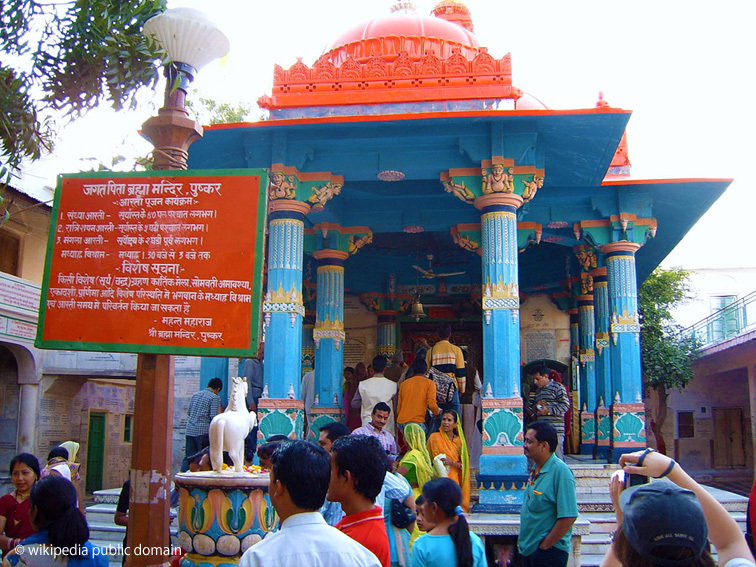 Ajgandheshwar temple consists of several shrines with Shiva Lingams and a space designed for yagams (fire rituals). To reach the place one follows winding, stony paths up and down the Avaralli hills. The walk is worth it in its own right; the landscapes are lovely. 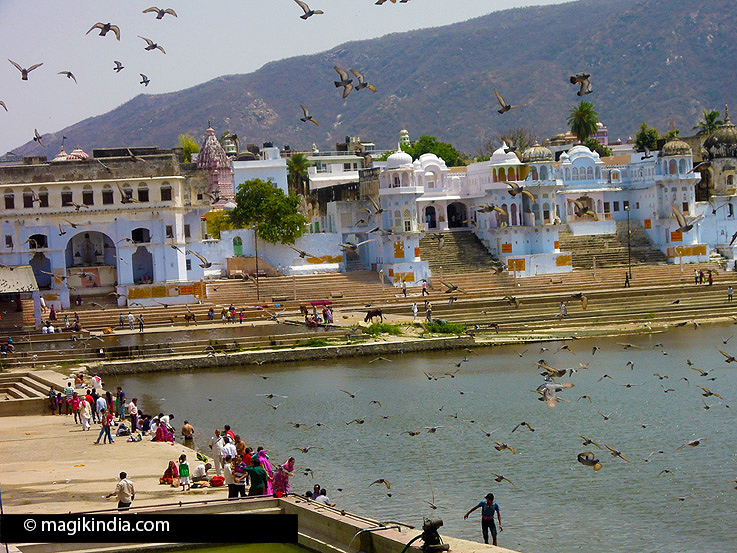 The town of Ajmer, 16km from Pushkar, is built around Lake Anasagar. 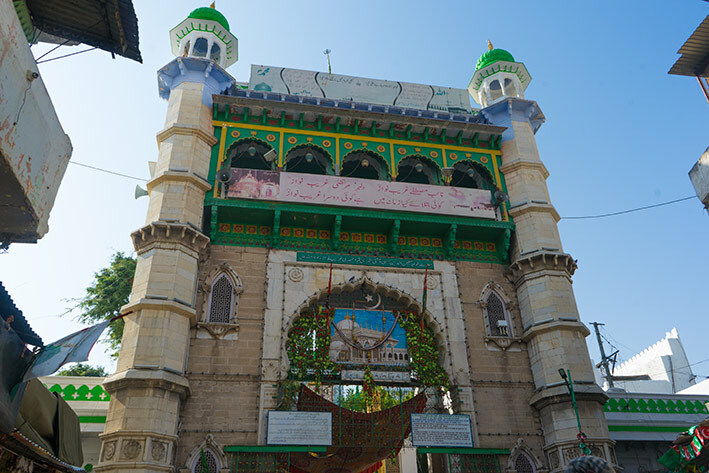 This bustling town, the third largest in Rajasthan, is famous for its Sharif Dargah temple dedicated to the Sufi saint Khwaja Moinuddin Chishti. Thousands of pilgrims of all confessions come here to pray. The Dargah, at the foot of Taragarh Hill, consists of several white marble buildings set around two courtyards, and the Akbari Mosque, built by the Mughal emperor Shah Jahan, which houses the domed tomb of the Sufi saint. Ajmer is also known for its Jain temples, the most famous of which is the Soniji Ki Nasiyan. This was built in the late 19th century by the Digambar branch of the Jain religion. 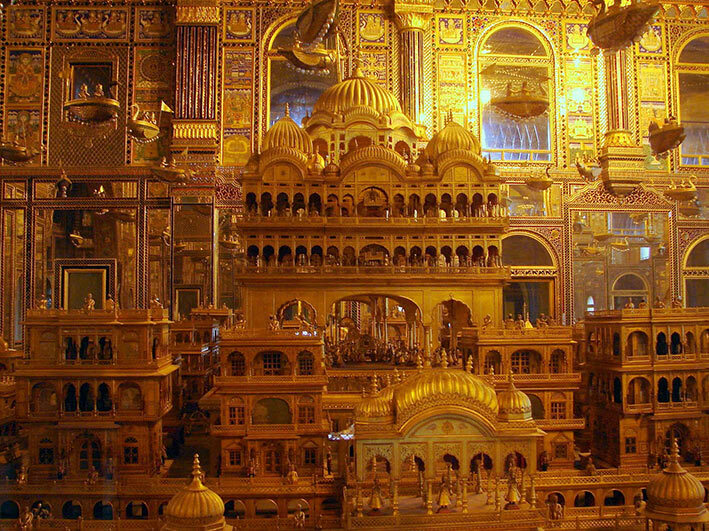 The main hall is clad in gold, silver and precious gems and is called Swarna Nagari (“city of gold”). It boasts several gilded statues of Jain saints and gilded models representing the foundations of the Jain faith.